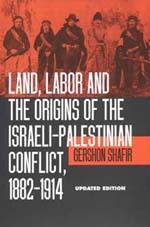 Gershon Shafir challenges the heroic myths about the foundation of the State of Israel by investigating the struggle to control land and labor during the early Zionist enterprise. He argues that it was not the imported Zionist ideas that were responsible for the character of the Israeli state, but the particular conditions of the local conflict between the European "settlers" and the Palestinian Arab population. Gershon Shafir is Professor of Sociology at the University of California, San Diego. He is author of Immigrants and Nationalists and editor of The Citizenship Debates.